The Hodogaya Chemical Group's “chemicals” are at work all over the place contributing to the control of weeds and pests on cropland, urban green areas, and golf courses; as well as the environmental conservation. By utilizing various intermediates, mainly those produced in-house, we continuously develop formulations that are safe and easy to use in order to meet both local and customers' needs. In particular, our herbicides are widely used in various fields. Backed by a long and proven track record of supplying these chemicals, our products continue contributing to weed control in various places. Through our affiliates, we actively promote the formulations of agricultural herbicides, lawn herbicides, insecticides, and other products using our original intermediates and other intermediates. We leverage our formulation techniques for examining the bioactivity and physical/chemical properties of each intermediate as well as their ease of use and safety, and then optimize the prescriptions of flowable, liquid, granular, and powder agents. 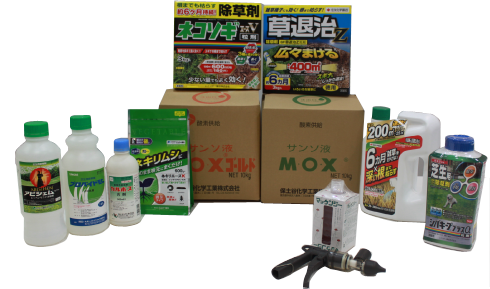 The unique agricultural oxygen supply materials manufactured by Hodogaya Chemical are widely used to improve the conditions of soil damaged by soil consolidation or excess moisture. Hodogaya Chemical's herbicides have been used for many years for the purpose of maintaining and preserving the environments that connect urban areas to forest land, thus contributing to the management of local environments. The herbicides developed by our company are commonly used in home gardens, on railway tracks, and in general industrial sites for maintaining and improving living environments and for managing green spaces that are important for preserving the environment and ensuring the safety. Most formulations previously used for those applications were granules, but the use of liquid-type products is now increasing due to their ease of use and cost efficiency. Also, to bolster our product line with new applications in the areas that are our strengths, we established Hodogaya UPL Co., Ltd. in March 2008. Further, in April 2011, we established Hodogaya Agrotech Co., Ltd. At this time, we are coordinating between the three companies (Hodogaya Chemical, Hodogaya UPL and Hodogaya Agrotech) to maximize development efforts.